Mrs Apple has lots of tasty fruit on her stall. She sells all sorts of fruit including oranges, apples, bananas, pears and strawberries. They all look delicious! Can you count up each type of fruit and write how many there are in each box? Then you can colour the fruit in! 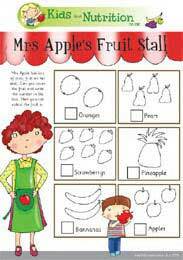 Why not Download Mrs Apple's Fruit Stall Puzzle and see if you can count all the fruit.